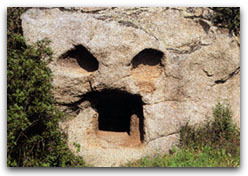 Sardinia has been inhabited since the Palaeolithic period, although there are not many traces left from that period. 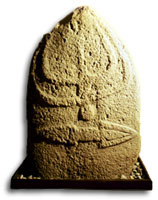 Since the Neolithic period Sardinia produced flourishing diversified cultures, that have left their traces in numerous monuments and handicrafted artefacts. The most ancient Sardinian people sheltered in natural caves first, then in village huts, and lived on agriculture, hunting and fishing in an intimate and religious relationship with the nature that surrounded them. They tried to insure the fertility of their fields and the fecundity of their animals, by worshipping a female Divinity, a Goddess-Mother, which they represented in different ways, making small stone and earthen idols, that they also used to protect the dead. With this in mind, a visit to some of the hypogetic tombs, which are spread throughout the Island, called "Domus de Janas", fairies or witches houses according to folk lore, which are carved in rocks, in mountain faces, often in inaccessible places, is well worth while. The necropolis of Anghelu Ruju, in Alghero, offers the opportunity to explore dozens of funeral caves , some of which are decorated with a light coat of red paint and stylised bull's heads, symbols of male fertility that represent the continuity of life, which are often found in these type of burial tombs. For people who are disposed to walk some distance, in the countryside of Villaperucio, in the province of Cagliari, there is the necropolis of Montessu, which is in a natural amphitheatre of great beauty and represents one of the most evocative examples of the funeral architecture mentioned above. 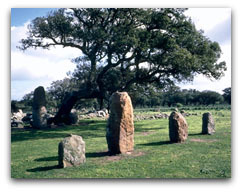 The Menhirs stones, which are called "Perdas Fittas" or "Perdas Longas" in the Sardinian language were connected to a religion of agricultural fecundity or a religion of veneration of ancestors. They are often found singularly, in couples or in small groups, and are sometimes found in a line in the countryside. The marvellous concentration of Pranu Mutteddu at Goni in Gerrei, is not to be missed. It is beside a group of tombs, dating back to the third millennium BC and it is formed by about 50 "pietre fitte" (closely packed stones), about 20 of which are aligned along the East-West axis, apparently referring to the course of the sun through the sky. © Copyright 1997/2003, Micro srl - All rights reserved.